The very first licensed and modern Chiropractic clinic in Cambodia. We are conveniently located in the center of Phnom Penh. Click HERE for the address and map. We are dedicated to provide exceptional Chiropractic care. Often patients find they get much more than their back pain relief when becoming our patients. They will understand better how their body work and will start a journey towards optimal health. By definition, a doctor is a teacher and we will teach you what you need to know to achieve your health goals no matter how big or small they are. Rotana Cheng is now working at ICC, he trained in native Australia and is specialised in Clinical Myotherapy. For more information please visit our Clinical Myotherapy page. 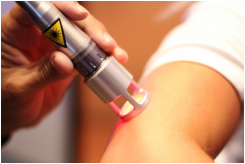 Now available at ICC: therapeutic class IV laser. We got top of the line laser, first of its kind in Cambodia, at ICC. Latest non-invasive procedure for anti-inflammation, pain control and stimulation of tissue regeneration. All under one roof in our state of the art chiropractic clinic. We speak English, Khmer, French, Chinese (Mandarin), Vietnamese and Thai.